Despite the rain that’s in the immediate term forecast, we’re finally starting to get into grilling weather! While this recipe seems a little involved for a weeknight dinner, there are a few modifications we’ve done to shorten the time frame just a touch plus there’s options to do some of it ahead of time. First, the pickled red onions need to be made ahead of time so they will just hang out until you’re ready for them – up to 48 hours. We’ve also prepped the burger mixture beforehand and substituted a pepperjack or monterey jack cheese (pictured here) for queso. Either way, as a result of salivating over this picture, these burgers have just made it back onto our menu. Pickled Onions: Combine vinegar, water, sugar, and salt in a small saucepan and bring to a boil. Remove from heat and allow to cool for 10 minutes. While cooling, slice up the onion and place in a medium heat-proof bowl. Once cooled for at least 10 minutes, pour the vinegar over the red onion slices. Cover and refrigerate for at least 4 and up to 48 hours. Green Chile Relish: Start by roasting the chilis. Heat broiler in oven to high heat and place a baking sheet with the chiles on it 6 inches from the heating element or char them on your burners if you have a gas stovetop. Use tongs to turn the chiles every couple minutes until blackened all over. Once blackened, add the chiles to a medium bowl and cover tightly with plastic wrap. Allow to cool about 10-15 minutes, then peel the chiles. Remove the seeds and ribs and chop into small pieces. In a medium bowl, whisk together vinegar, honey, olive oil, and cilantro. Stir in the diced chiles, and season with salt and pepper. Allow to sit at room temperature for at least 30 minutes. Burgers: Preheat grill. In a large bowl, lightly mix together beef, salt, pepper, Worcestershire sauce, garlic, and red pepper flakes until just combined. Shape into four patties, each about 1 1/2 inches thick. Grill the burgers to desired doneness, flipping once. Time to eat! 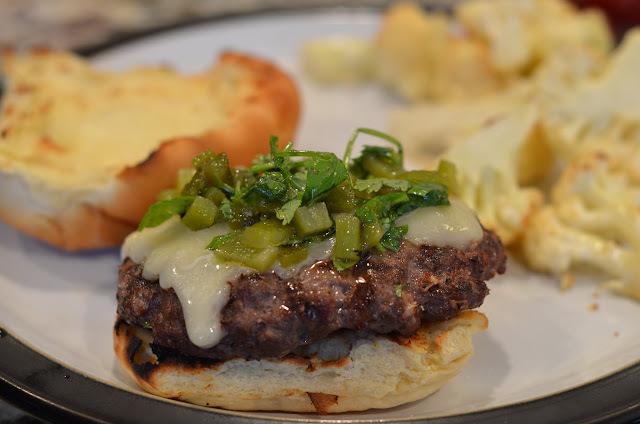 Pile queso or cheese, chile relish, and pickled red onions on top of your burger and “nom, nom, nom”! Recipe ever so slightly adapted from Pink Parsley; adapted from Bobby Flay’s Throwdown!